Thomas and Luzia run this bio-dynamic farm situated in the unspoilt pastoral landscape of Donegal. They are committed to sustainable land use systems. The farm is situated in a special area of conservation, with a choice of marked nature walks. The farmhouse has been constructed with chemical-free building materials as far as possible. The family runs a working farm with Derry cows, sheep and poultry. There is a friendly and informal atmosphere. Groups of up to ten can join a Eco-camp with outdoor work and education and outdoor adventure, like mountaineering, bird watching and canoeing. There are two single rooms and three holiday flats (each 75 m2) with one or two bedrooms, a kitchen and a living/sitting room. One of the flats is designed for disabled people including people with wheelchair disability. You live away from the family, and can enjoy watching the farmhouse activities or join in if you wish. Organically grown herbs, vegetables and fruit are available all year round, as is home-baked bread. If you want you can enjoy wholesome hot meals prepared with almost exclusively organic ingredients. 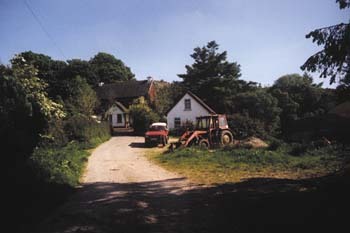 The farm has its own land along the River Owenea where the fishery board has developed angling facilities, also a stretch of several 100 meters of riverbank into a wheelchair accessible path, so everybody can enjoy salmon fishing with the fly rod as well as spinning or other rods.The farm is situated about 3 km from the charming village of Glenties. Ideally situated for day tours to the cliffs of Sleave, Glenveigh National Park and the beach.